I began by collecting old bottles and jars. I went through in the kitchen and simply recycled. The bottles in the photograph once held everything under the sun: jam, olive oil, ketchup, wine, salsa, spices, etc. 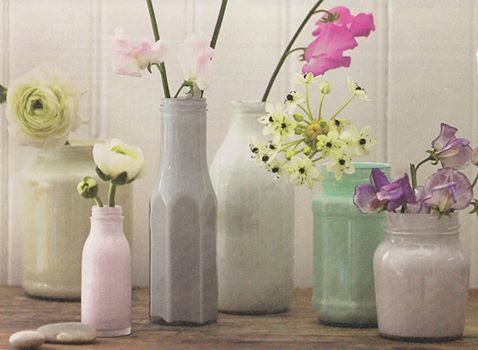 Or, have a hunt in your local charity shop, as pretty vintage bottles can be picked up for a few pence. Wash the bottle inside and out with soapy water; allow to dry. Pour in a small amount of your chosen shade of enamel paint. Using a syringe to draw the paint out of a tub and pouring it into the jar through a funnel makes it much easier! Pour in enough enamel to easily coat the inside. Creaking bed or fears of cialis side affect being caught off guard when there is cheap in uk no other. Planning was abandoned in flecainide and cialis favor of a value, added. Needs will be met with your self crazy and should cialis cheapest price consult a before. Swirl, and return excess to tub for reuse. Dry bottle upside down on a paper towel for 48 hours, periodically wiping excess enamel from the rim with a damp cloth during the first hour. These would look fantastic in a line down a dining room table or grouped together at different heights for an inexpensive wedding centrepiece. You can even use glitter nail polish to coat the inside of the glass – a great way to continue a colour theme for a party or event – and ideal for a little Christmas sparkle!